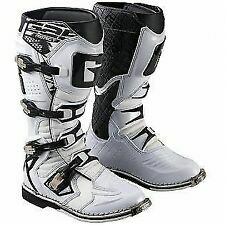 Gaerne Sgj Youth Kids Mx Motocross Boots, good condition some discolouration being white but no rips or damage us size 1. 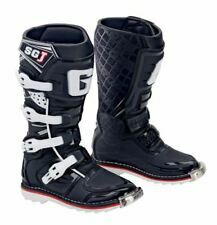 Gaerne Trials Boots Eu43. Used condition with alot of scuffs. No rips or tears. All buckles are fine. Soles are good. Will make a good spare or cheap pair for someone. 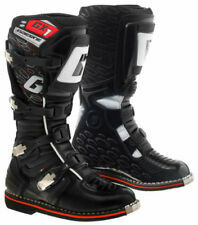 Boys and girls motocross boots. only a few marks on the boots. very good condition. the best boot you can get. i paid £165 for these a few months ago. This kids boot is without a doubt one of the best money can buy. Gaerne use top grain leather for the main construction and a soft microfiber on the front to give a comfortable fit. The Gaerne SGJ gives the kids the ultimate protection.